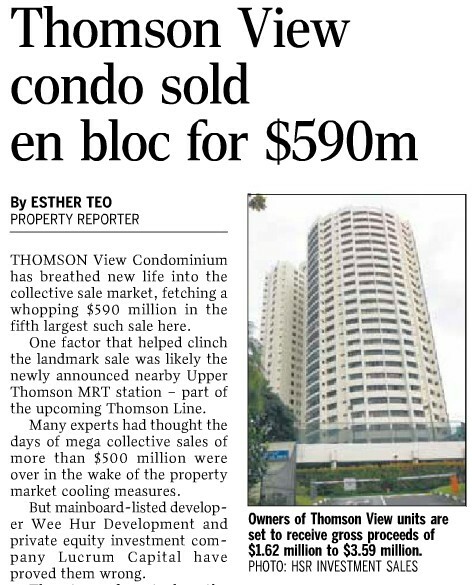 Thomson View condominium has been sold to a consortium led by Wee Hur Development Pte Ltd and Lucrum Capital Pte Ltd for $590 million after two previously unsuccessful en bloc attempts. Including an estimated $107 million premium to enhance the property's use and a $90 million premium to top up the lease from the remaining 62 years to 99 years, this translates to $712 per square foot per plot ratio (psf ppr). The 540,314-sq-ft site, located along Upper Thomson Road, is designated for residential use with a 2.1 plot ratio and 24-storey maximum height. It comprises 100 residential apartments of 1,313 sq ft, another 100 residential apartments of 2,023 sq ft, 54 townhouses of 3,842 sq ft and one shop lot of 1,862 sq ft.
With the collective sale, owners are expected to receive proceeds of $1.62 million, $2.30 million, $3.59 million and $2.82 million respectively, representing an en bloc premium of 30 to 40 per cent above the current resale prices of individual units. The plot can be redeveloped into a new condominium with about 950 units averaging 1,200 sq ft.